…. DON’T for godsake issue ANY media release to Ratepayers and Residents on HOW TO STAY SAFE given the DANGEROUS and DEGRADED Aurora/Delta network —which can injure or kill. 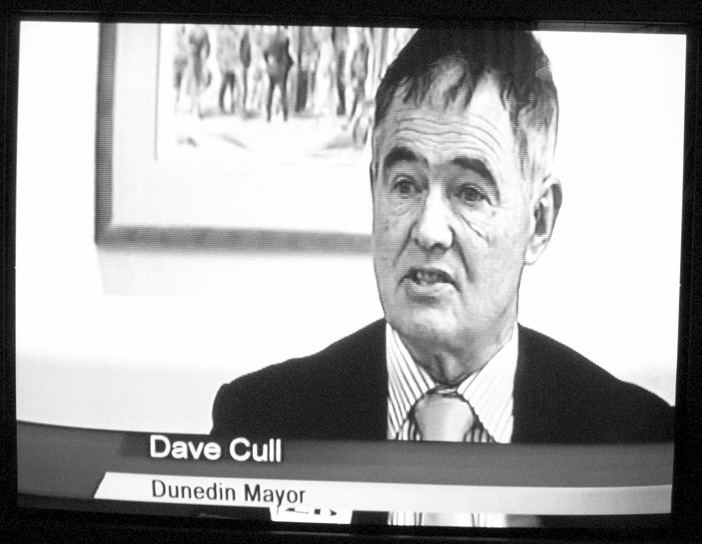 It is true that whistleblower Richard Healey has contacted the Mayor of Dunedin to offer overview and discussion but the Mayor has NOT responded. The Dunedin City Council has denied being soft on Aurora Energy over the risk to the public caused by rotting poles. The Central Otago District Council (CODC) has been applauded by whistle-blower Richard Healey for asking a series of questions over the danger presented by compromised poles, but he has called on other councils in the region to take a tougher line. …. [DCC chief executive Sue Bidrose] disputed Mr Healey’s suggestion the council was more concerned about its role as owner of Aurora and Delta than health and safety. The Public absolutely know Delta “is guilty of “spin” and trying to minimise the enormity of the issues it faces over safety and network maintenance”. 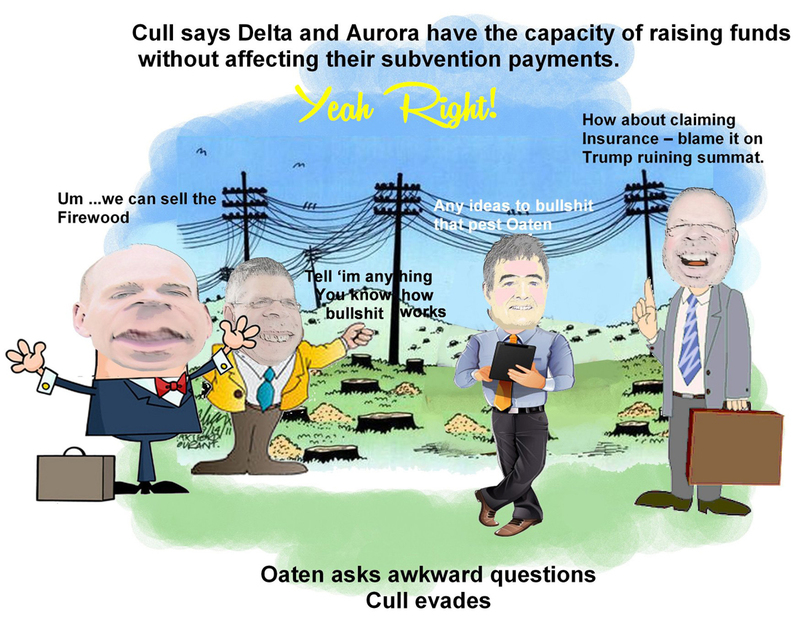 Aurora Energy and its sister company Delta have had another rough couple of weeks as allegations they have mismanaged Dunedin and Central Otago’s power network continue to mount. The two companies regularly choose not to answer questions posed by the Otago Daily Times. Here are some of those questions, which chief executive Grady Cameron belatedly responded to yesterday. ODT —Question 5. What is Delta’s response to the suggestion from two current staff that most people who work in the field support Richard Healey’s stance and think it is a good think (sic) he went public? No one on the Aurora/Delta executive or the Boards has -For Years- given a flying toss about YOUR Health and Safety —not while they’ve troughed, not while they’ve supported the DCHL regime to pay DCC unholy dividends. We know The Guilty, can Name and Vilify Every Last One of Them. 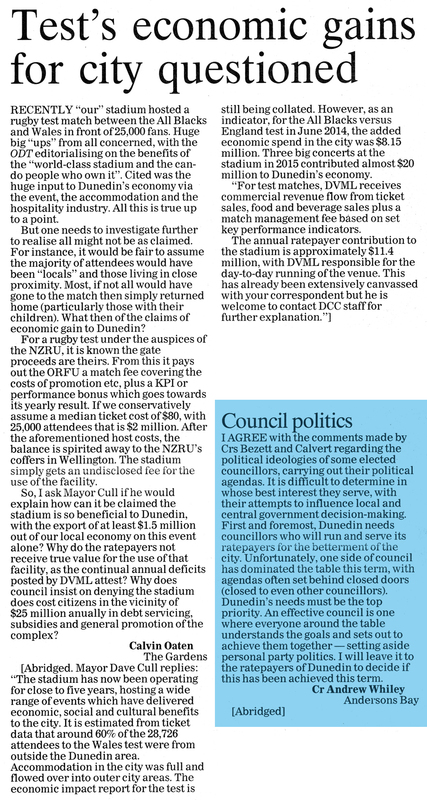 The god awful millstone stadium is due to have its 5th birthday soon – ODT will be saturated, note bilge leaking into the Op-ed pages, already. WE ONLY CARE ABOUT . . . . 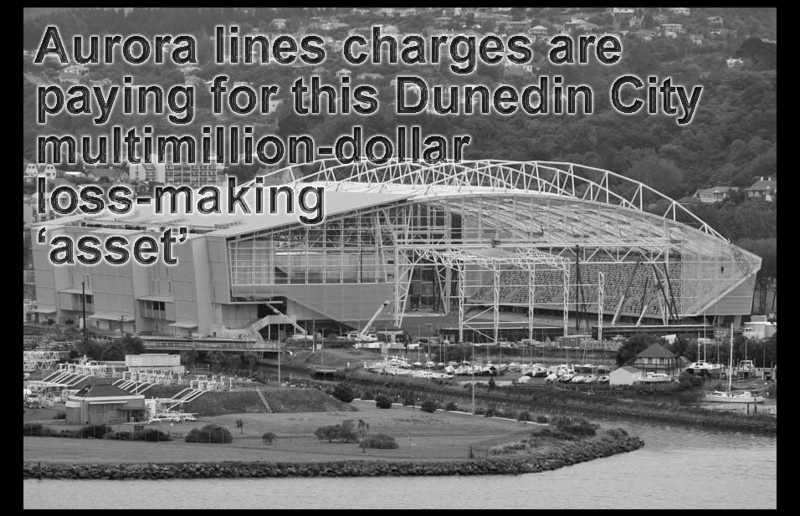 THE UNMITIGATED UNPRINCIPLED FLOW OF RATEPAYER MONEY AT +$20MILLION PA to subsidise the Stadium, DVML/DVL, Professional Rugby and Grey Hair Events —meanwhile draining council owned company Aurora Energy of development capital sufficient to satisfy the regulator of lines companies, the Commerce Commission. 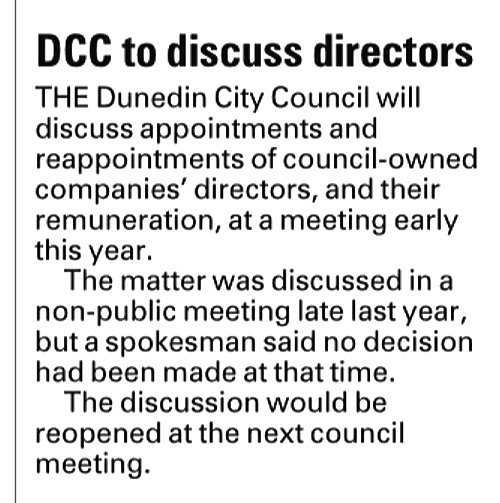 The Dunedin City Council is set to have some fresh blood in its midst with five current councillors confirming they won’t seek re-election. Many of those not standing have cited the large workload and increasing bureaucracy as a job deterrent. With that in mind our Word on the Street team asked the public whether they care about the upcoming local body elections. Submitted by MikeStk on Sat, 06/02/2016 – 11:26am. Now local rugby is making million dollar profits off our backs but is still not contributing a cent to pay for their rugby stadium – a bunch of wowsers eating at the public trough hoovering my hard earned dollars out of my pockets to subsidised their booze fed events. I’ll say nice things about your rugby stadium the day I stop having to pay for it and for your fun. Submitted by MikeStk on Sun, 07/02/2016 – 2:25pm. Bones: As I said, my issues with the rugby stadium are with the finances, not whether anyone thinks it’s a good stadium or not. Solve the financial issues, have rugby pay what they owe and make the ratepayers financially whole and I’ll be happy. Remember that the ORFU once owned Carisbrook free and clear – the grandfathers of the current generation of rugby official built and paid for Carisbrook out of their own pockets. That’s the way it should be done. But over time they started spending more money than they were taking in, rather than doing the financially sensible things like spending less or charging more. They started mortgaging their major asset, with no real way to pay it back, and eventually they owed the DCC $2m, and the bank a few million more – a terrible way to honour the wonderful legacy they had been gifted by their canny, thrifty grandfathers. Then in a moment of financial lunacy they decided to get the city to build them a new stadium, to replace Carisbrook – the bank must have looked at that and raised their collective eyebrows somewhere over the backs of their heads – Carisbrook, the thing they had mortgaged was now worth less than the loan. You can see why they offloaded it on the city in a deal that cost the ratepayers millions – if they’d sold it themselves their bank account would be in the red. So much for their grandfather’s legacy – squandered to nothing.